As Skratch the Cat Burglar scaled the heights of the old abandoned castle, the Wabbit kept a look out. "What news?" he whispered into his radio. "Hang on Wabbit and I'll get a better hold," said Skratch as he scrabbled for grip on the slippery stone surface. "Take your time, what can you hear?" said the Wabbit. "It's the Euls, I can hear them laughing," said Skratch. "What about the valuable painting?" hissed the Wabbit. "They're talking about it now," said Skratch. "There's a bit of chat about Abstract Impressionism," he added. "Pshaw!" said the Wabbit. "We're not here for a seminar, Wabbit," said Skratch. "Wait a second, they said something about Wabbit Affairs then giggled." "Can you see them now?" asked the Wabbit. "Yes," said Skratch, "they're looking at glossy art books and pointing." 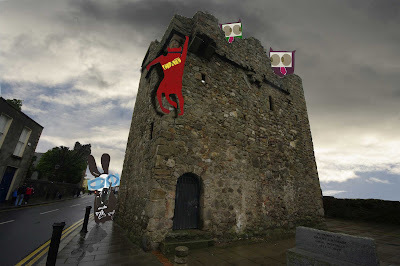 "A kick in the arts is what these Euls need," said the Wabbit, "can you see our painting?" "It's not there," said Skratch, "it's somewhere else." "Grrrr! Where?" shouted the Wabbit. "Shhhh," said Skratch. There was a long silence while the Wabbit listened. Then the radio crackled. "It's the Hellfire Club. The painting is there." said Skratch. "The Carrot Club?" asked the Wabbit hopefully. "Hellfire!" said Skratch. Another silence fell and the Wabbit was glad Skratch couldn't see his face. "Hello Wabbit are you there? Hello?" said Skratch urgently. Suddenly the radio spluttered. "I was calling in Ghost Bunny," said the Wabbit.